This award celebrates and acknowledges a woman who is committed to furthering our community’s Agenda for Change, and honors her achievements in educating, empowering and inspiring women and young girls to be philanthropic leaders in Dane County. Her impressive career spans four decades of leadership and policy-making in professional associations, academic institutions, and governmental agencies at state and national levels. Dr. Nichols is a United States Navy Veteran and the former Chief Executive Officer of the Commission for Graduates of Foreign Nursing Schools (CGFNS) International. 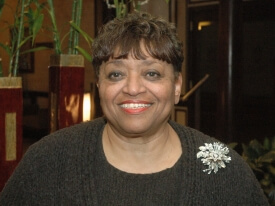 She has been a consultant on nursing workforce and diversity issues to the U.S. Departments of Labor, Health and Human Services and the Office of Minority Health. Dr. Nichols holds a Baccalaureate in Nursing from Case Western University, a master’s from the UW-Madison and five honorary doctoral degrees for leadership contributions to the delivery of healthcare in urban and rural settings. She is a dedicated member of the Alpha Kappa Alpha sorority (AKA). Born in Waterville, Maine, Nichols has called Madison home since she moved here with her husband Larry in 1966. Together they have identical twin sons, Kent and Karl, a daughter, Nichelle, and ten grandchildren. Nichols is a vociferous reader and world traveler. She has been to every continent except Antarctica. United Way Involvement: Barbara has been on the Board of Directors since 2014 and is currently Chair of Vision Council. She is also the former Chair of the Self-Reliance & Independence Community Solutions Team and participated in the Strategic Collaboration Capacity Building Team and the Task Force for Transformation.